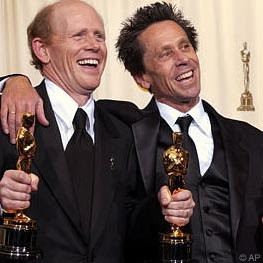 The first time I ever saw producer Brian Grazer was during the 2001 Academy Awards. A Beautiful Mind had won Picture of the Year and following Opie to the stage to accept the trophy was a smallish man with the most sunken face and spikiest hair I'd ever seen, simultaneously, outside of a Sid Vicious biopic. Still photos don't do Grazer justice. You really have to see the face and the hair move (or not move) to appreciate the stunning dichotomy. I was agnostic on whether or not it was a good look -- although such erect hair and tight skin is always impressive in middle age. But I did recognize anyone who could stand out so much in a room full of professionally constructed hair and make-up is a force to be reckon with. I figured I'd be hearing more from this Grazer fellow. I didn't, although that was only because I wasn't paying enough attention, and, as a producer, he stays as much behind the scenes as such a fabulously-headed person can. His recent resume is impressive. So much so the Los Angeles Times thought it was a good idea to install him and his one-of-a-kind look as guest editor of their Sunday opinion page -- because movie moguls do have opinions too. It wasn't long before things went awry. From a conflict of interest standpoint, the wrong people were sleeping with the wrong people. Although Grazer, himself, was sleeping with nobody. Which seems about right for such an unearthly being. Now there will not be an opinion section in this Sunday's LA Times. And the editorial page editor has resigned over the whole affair. Given the tough time the West Coast's foremost paper has been having of late, I wouldn't be shocked if the LA Times decides to pack it in and quit the news game all together. Let that be a lesson to everyone: They might look shiny and intriguing on television, but if you bring one of them into your home you only have yourself to blame for what happens next.